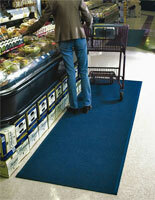 These commercial door rugs blend style and function into a top-grade industrial flooring product. 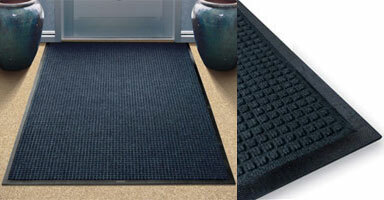 This busines entrance carpet absorbs water, discouraging bacteria from accumulating in the mat. A raised-ridge design keeps visitors from tracking in debris and dirt. Each of these polypropylene door rugs are Certified Slip Resistant by the National Floor Safety Institute and anti-static rated at 1.2KV by the AATCC. This rug for industrial use placed in an entry way of any high-traffic environment are sure to preserve office carpeting. 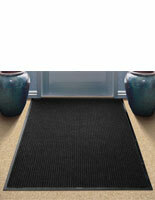 Just vacuum, hose off, or steam clean this navy mat and it looks like new again.